Sing the virtues of pumpkin! This round, orange beauty is packed with fiber, vitamins, antioxidants and is low in calories. 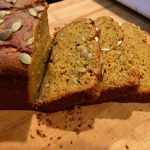 Our favorite way to add pumpkin into our diet is by whipping up a loaf of moist and nutritious, Gluten Free Pumpkin Bread. We mix shelled pumpkin seeds, (pepitas,) into the batter and sprinkle them on top for extra nutrition and crunch. For those of you who are familiar with our Super Moist Gluten Free Banana Bread recipe, you will notice that this is the same. We swap out then caramelized banana for organic canned pumpkin. We also added spices to jazz up the pumpkin flavor. To make your own pumpkin pie spice, check out this fabulous blend by Joy the Baker. Click on the link. Feel free to add chocolate chips or your favorite nut. 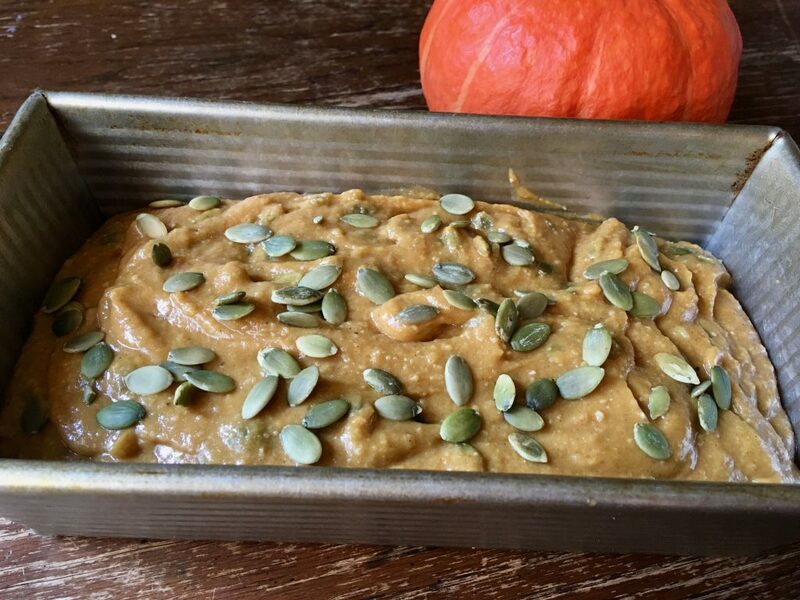 Alternatively, bake up a loaf of pure pumpkin goodness without any add-ins. Let us (and others!) know how this recipe worked. Please leave a comment in the section provided below the recipe. We love hearing from you! Substitutions: For information on how to substitute an ingredient, click here. Dry toast pepitas or other nuts (optional – may use raw or no nuts.) 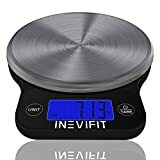 To dry toast: cook pumpkin seeds in a dry 9- to 10-inch heavy skillet (preferably cast-iron) over moderate heat, stirring constantly, until puffed and golden, 4 to 5 minutes. Transfer to a small bowl to cool. 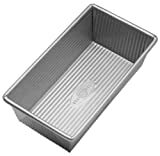 Spray or grease the interior bottom of a 8.5 x 4.5 loaf pan if using non-stick. If not, grease and flour the entire interior of the loaf pan. 71g (2.5 oz) Dry Toasted Pepitas – nuts are optional (1/2 C) See note for toasting instructions. Please read prep note above. Thank you! 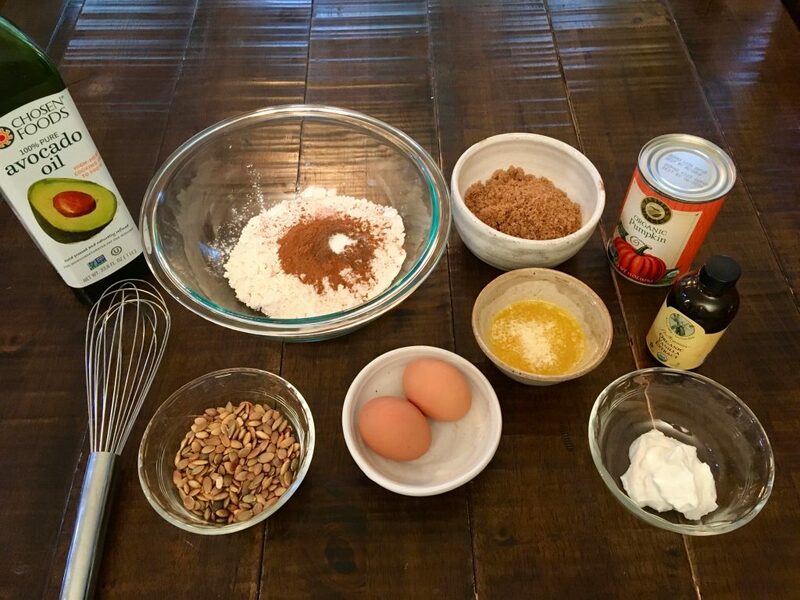 Step 1: In a medium bowl, whisk together the dry ingredients. Set aside. Step 2: In a separate large bowl, add all of the wet ingredients. Mix thoroughly using a whisk. Step 3: Add the dry ingredients to the wet ingredients and stir with a sturdy mixing spoon until all of the dry ingredients are incorporated. Step 4: Pour the batter into the prepared loaf pan and place in the middle of the center oven rack. Step 5: Bake for 30 minutes and check the top for over browning. If the loaf is still golden, cook for 15 more minutes and check again. If turning excessively brown, tent with foil. Step 6: Total bake time is 50-60 minutes depending on your oven/loaf pan. The internal temperature of the bread should be about 205 degrees Fahrenheit (96C). In our 375 degree oven, using the USA Pan Bakeware, it takes 60 minutes to bake. If you do not have a thermometer, a toothpick dipped into the center of the loaf should come out clean. Step 7: Remove the pan from the oven and allow it to sit on the cooling rack for a few minutes. Turn the pan on it’s side and release the loaf. Allow the loaf to cool on the rack on its side. Step 8: If there is any bread left over after you start into it, wrap it in plastic wrap or seal it in an airtight container. It will stay on the counter for 3 days. For the chocolate lover: Add 99g (3.5 oz) Mini Chocolate Chips (1/2 C) to the dry mix. To freeze: This bread freezes beautifully for up to a month! You can cut individual pieces and wrap them or wrap the whole loaf in a freezer safe container and store for a month. Thaw on the counter or in the toaster on the lowest setting. The nutrition information provided below is for the recipe as written using salted butter and sunflower oil. One loaf yields about 19 – 45g slices.